Thank you to everyone who entered and a huge thanks to Origins for sponsoring this fabulous giveaway! 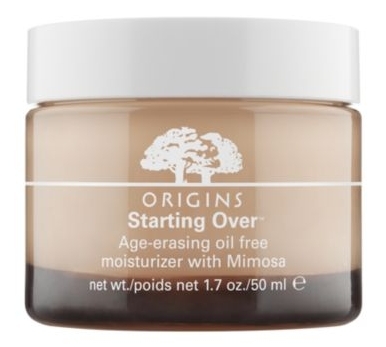 Origins gives skin a new beginning with the new Starting Over Age-erasing moisturizer with Mimosa . This daily hydrator utilizes high-performance plant ingredients proven to help rebuild natural collagen and reduce the appearance of fine lines and wrinkles. We’re giving away Origins Starting Over Age-erasing moisturizer to FOUR lucky winners!! Visit Origins.com , then leave a comment on this post and tell me what other Origins product (Besides ‘Starting Over’) you’d be interested in trying in the future. GIVEAWAY! Enter to win Origins Starting Over Age-erasing Anti-Aging Moisturizer from @thehousewife http://wp.me/pbeJJ-5jx Please RT! Contest runs from Feb 22nd till Feb 28th. Last chance to enter is Feb 28th at 11:59pm ET. A winner will be contacted on or before March 12th, 2010 and asked for full name, along with their mailing address. If no response is given within 48 hours, a different winner will be chosen, so please be sure to check your email. Must be 18 or older to enter. Contest open to USA! Prizes will be provided and shipped directly by Attention PR in NYC. I love me some good aromatherapy and this one sounds wonderful! “Calm To Your Senses™” Lavender and Vanilla body cleanser. .-= Kathi Moore´s last blog ..Cinderella and the Gala =-. The Ginger Souffle looks wonderful! I only use Organic products and I got a sample of this the other day and I am in love with ” starting over”. So many thing to lem after! I’d like to try the YouthTopia Serum, both of their bronzers Sunny Disposition and the ginger Essence Fragrance. I’d like to try the High Potentcy Night-A-Mins–works while you sleep to help repair skin!! Sounds good to me! Thanks! I subscribe to The Fashionable Housewife on Google Reader. I’m an email subscriber to the newsletter. I’d LOVE to try the Night Health™ Bedtime Face Cream! .-= GeorgiaMist´s last blog ..Elliott Lucca — Expect the Unexpected! =-. I would love to also try GinZing and High Potency Night-A-Mins. I have seen so many ads for the GinZing. Liquid moisture with White Tea. I’m a fan of Origins on Facebook. .-= Angela´s last blog ..Kittenish Friday =-. .-= Angela´s last blog ..Brushlab Pure Ceramic Hair Brush =-. I woud love to try Origins Starting Over Cream. I would also really like to try Origin’s All-Purpose High-Elevation Cream, I have very dry skin, and this sounds like an effective product. A Perfect World™ Antioxidant moisturizer with White Tea sound wonderful! .-= Peggy Gorman´s last blog ..Let’s go Bridal Shopping at the CSN Stores and Win! =-. Ginger soufflé whipped body cream!!! I LOVE Youthtopia, use it daily, but have run out so would like to give one of their newer products a try. .-= kirsten @ Barkingdogshoes´s last blog ..Born Peony and Other Spring Posies =-. I’d like to try Clear Improvement and Drink Up. Can’t decide which one I want to try more. I subscribed to The Fashionable Housewife newsletter! Love ORIGINS! I would like to try their whole line of ginger products. Especially the ginger body scrub!! .-= styleezta´s last blog ..Holy Moly I’ve been busy! =-. I’ve been wanting to try the Mega Mushroom cream. .-= Mary´s last blog ..I’d Rather… =-. After checking out the Origins website, I would like to try the Youthopia eye cream. I’ve never used any of the skin care products, only the bath & body line… LUV LUV LUV the Ginger Souffle!!!! I have always wanted to try the Grapefruit Body Souffle! Fan of The Fashionable Housewife on Facebook! I would love to try youthtopia. I love the concealer, a perfect world skin care and those lip moistures. I am a fan of Origins on Faacebook. .-= Bianca´s last blog ..Twill Jackets for Spring =-. I would like to try the Youthtopia™ Firming eye cream with Rhodiola. My skin is so dry this winter. I would love to try the Make a Difference night-time moisturizer. I’ve used Origin’s ginger perfumes for years. They have a new one now that mixes in bergamot (sp?) and some other scents. I would love to try that. The whipped moisturizers are to die for in the winter months! Can’t wait to try something from Origins! I’d love to try the All-Purpose High Elevation cream! .-= Angela´s last blog ..Bliss Triple Oxygen Instant Energizing Mask =-. My sister loves all the Origins products … so maybe it’s time to try it myself! .-= styleezta´s last blog ..Look cute this spring in a skirt! Fab choices for under $24!! =-. I’m a redhead with blonde eyebrows, so I’d love to try fill in the blanks brow enhancer! I subscribed to the fashionable housewife newsletter – friendliestghost at gmail dot com. I would be interested in trying the High Potency Night-a-Mins. I would like to try the Origins Brighter By Nature Serum product. .-= styleezta´s last blog ..Rethink Your "Must Haves" and GIVEAWAY!!! Enter now :) =-. Robyn I give this product a high 5!!!!!!!!! .-= Robyn Russell´s last blog ..robynforu: RT @thehousewife: LAST DAY to enter to win Origins Starting Over Age-erasing Anti-Aging Moisturizer from @thehousewife http://wp.me/pbeJ … =-. i would like to try their foundation. since it’s natural it must be better for my aging skin! I would like to try the never a dull moment cleanser! .-= annalene´s last blog ..And the CSN Stores giveaway winner is… =-. First entry: I love to try the Plantidote™ Mega-Mushroom Face Serum too! Shop Silver Sandal Heels, Short Sleeved Blouses, Flat Silver Shoes, Mules and more. Get this widget.